How To Remove A Splinter Without Tweezers: 5 Natural Methods That Work! The last few weeks have been nothing short of crazy. We decided to move into our new home with only 6 days for me to enroll our daughter into her new school, pack up our condo, organize movers, and try to make this place livable so we weren’t tripping over boxes every 30 seconds. And while there were moments when I questioned my sanity for agreeing to undertake this kind of chaos, it was by far one of the best decisions we’ve ever made as a family. My daughter loves her new school, my husband’s commute to work has been cut in half, I’m no longer spending half of my day driving, we’re spending a ton of time outdoors breathing in fresh air and soaking up as much Vitamin D as possible, and when I went to pick my sweet bear up from school on Friday, I was so incredibly excited with everything the weekend had in store for us. Lazy mornings in bed, trips to the park, picnics in the backyard…. But when the teacher caught my eye and started walking towards me before I could make my way out of the school playground, I got a knot in my stomach for fear of what she was about to tell me. As it turns out, they had taken the kids out on a nature walk after lunch, and my daughter had managed to get not one, but FOUR splinters in her right hand, and refused to allow her teachers to remove them. Now, one thing you must know about my daughter is that she does not handle scary experiences very well. She always feels brave and excited after we’ve helped her overcome something frightening (like when I took her to get a pea removed from her nose last month), but in the heat of the moment, she would much rather I just apply a band aid to whatever area is causing her harm and pretend it never happened. Even if she’s in pain. So when I saw all of those band aids on her hand, I knew things were about to get real. My initial reaction when we got home was to start poking and prodding at her hand with a pair of tweezers, but since we’re still living between 2 homes and I had no rubbing alcohol or other sterilizing substances on hand, that wasn’t an option. And judging from the way my little one was behaving, that wasn’t going to work anyway. So rather than racing off to our closest pharmacy to stock up on medical supplies, I decided to grab my computer and learn how to remove a splinter without tweezers in hopes I could find a more natural, pain-free method that would work. Here are the ideas I found most helpful. This was the first idea I tried, and it was successful in getting one of the splinters out. The idea is that, if the splinter is poking out at the tip of the skin, you can place a piece of sticky tape overtop of it and then remove the tape in the opposite direction so it pulls the splinter out. If you don’t have sticky tape handy, you can also try Elmer’s glue. Simply apply the glue, let it dry, and then remove in the direction of the splinter. When the tape didn’t work on the remaining splinters, I decided to soak my daughter’s hand in a bowl filled with water and epsom salts. I let her play with her iPad for about 20 minutes while doing this in hopes it would soften her skin and draw the splinters to the surface. It worked for 2 of the splinters, so it was definitely a worthwhile experiment and one I will be using again! With one stubborn splinter left, I was at a loss and decided to give the baking soda trick a try. I simply combined baking soda and water until I had a paste, placed some overtop of the splinter, applied a bandage, allowed my daughter to sleep on it, and prayed that the splinter would be poking out of her hand when she woke up in the morning. Each of these foods are said to draw a stubborn splinter to the surface of the skin after 24 hours, so the idea is to place the food overtop of the affected area, cover with a bandaid, and pray like mad. My initial reaction was to go the raisin route after watching how effective it was in removing a stubborn splinter on YouTube, but I was too frightened it would cause an infection and chickened out at the last minute. I’ve since read countless posts and comments from others claiming one of more of these food methods really work, so I will definitely give one of them a go the next time I get a splinter myself. In the end, I was able to remove the stubborn splinter from my daughter’s hand by using baking soda to draw the splinter closer to the surface of her skin, epsom salts to soften her skin, and a needle and tweezers for a quick and relatively painless extraction. It wasn’t an overly fun experience as it took almost 48 hours to get all of the splinters out, but judging from how deep that last splinter was embedded in my daughter’s hand, there is no way we would’ve gotten it out without the assistance of a doctor (and a lot of crying and screaming) had we not googled ‘how to remove a splinter without tweezers’ and given some of the crazy ideas a try! 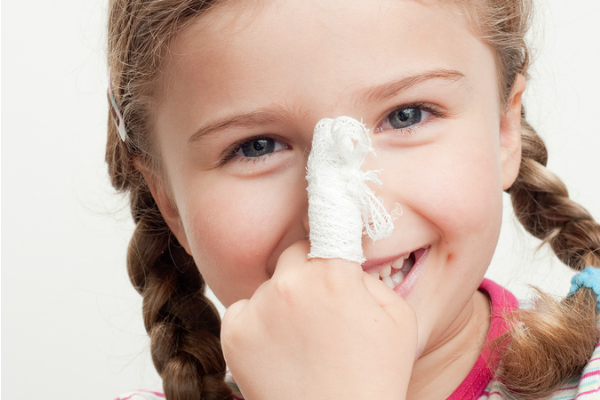 Here’s to a healthy, safe, and splinter-free summer! 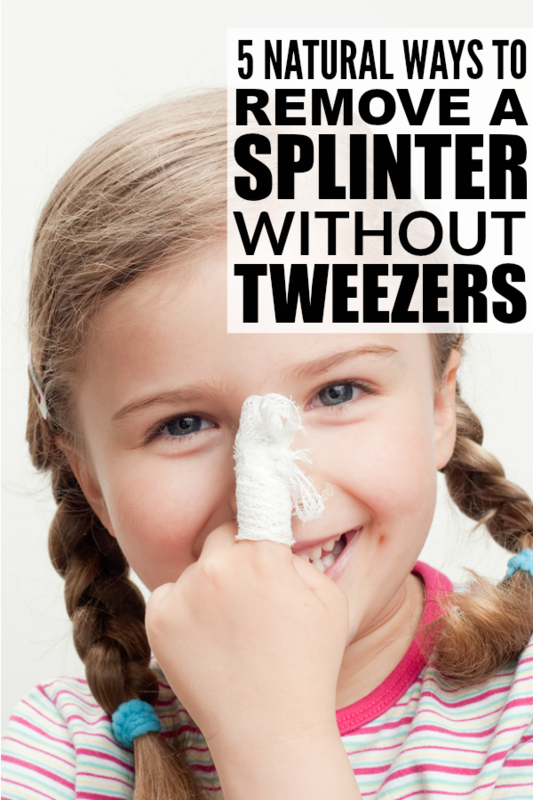 If you found these tips to teach you how to remove a splinter without tweezers helpful, please share them on Pinterest! And if you’re looking for more parenting-related tips and tricks, please follow our Parenting board where we share all kinds of great ideas!